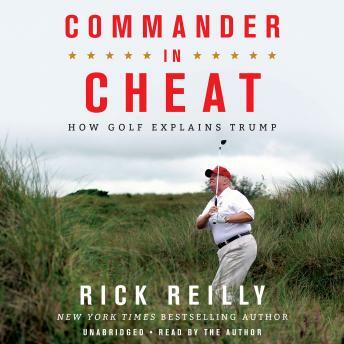 Based on Reilly's own experiences with Trump as well as interviews with over 100 golf pros, amateurs, developers, and caddies, Commander in Cheat is a startling and at times hilarious indictment of Trump and his golf game. You'll learn how Trump cheats (sometimes with the help of his caddies and Secret Service agents), lies about his scores (the 'Trump Bump'), tells whoppers about the rank of his courses and their worth (declaring that every one of them is worth $50 million), and tramples the etiquette of the game (driving on greens doesn't help). Trump doesn't brag so much, though, about the golf contractors he stiffs, the course neighbors he intimidates, or the way his golf decisions wind up infecting his political ones. For Trump, it's always about winning. To do it, he uses the tricks he picked up from the hustlers at the public course where he learned the game as a college kid, and then polished as one of the most bombastic businessmen of our time. As Reilly writes, 'Golf is like bicycle shorts. It reveals a lot about a man.' Commander in Cheat 'paints a side-splitting portrait of a congenital cheater' (Esquire), revealing all kinds of unsightly truths Trump has been hiding.